The Manitoba Bison women’s hockey team continued to roll this weekend, picking up a weekend sweep of the Mount Royal Cougars. The Bisons won 4-1 on Friday and 3-1 on Saturday. Forward Alanna Sharman led the way offensively, with four goals over the two game set. Rachel Dyck started both games in net for Manitoba, allowing a single goal in both games, en-route to securing her third and fourth wins of the season. Alana Serhan, Maggie Litchfield-Medd, and Tasmine Hemingway also scored for the Bisons. Manitoba returns to the Wayne Fleming Arena this weekend, taking on the Lethbridge Pronghorns on Oct. 25 and 26. 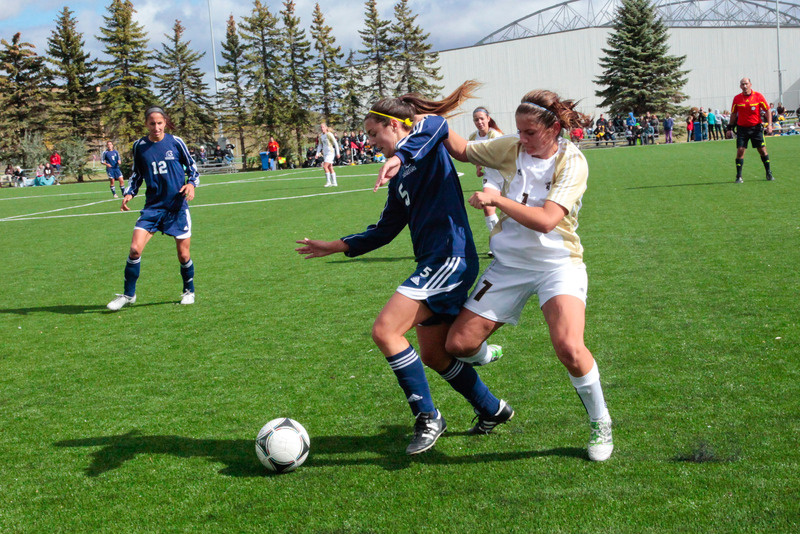 Both games are at 1 p.m.
Fighting for their playoff lives, the Bison soccer team was unfortunately eliminated from post-season contention over the weekend, after a Saskatchewan sweep of Regina . Battling hard, Manitoba finished the season with two tough draws against the Lethbridge Pronghorns. Saturday ended in a stalemate for Manitoba as neither team was able to score. Both teams struggled to put shots on goal, as Bison goaltender Martina Arran faced just one shot on goal and Lethbridge goalie Myriah Marino faced three. Manitoba’s chances were quality, and included an opportunity from captain Sarah Haiko, as well as a great save by Marino on Bison rookie standout Bruna Mavignier in extra time. Sunday’s season finale saw the Bisons put up eight shots on goal, as they flooded the Pronghorn net with pressure. Six of the Bisons’ eight shots on net occurred in the first half, where they notched their only goal – coming from Mavignier 34 minutes in. Lethbridge picked up their play in the second half, putting three shots on goal after having none in the first half. Kayla Wurzer would score the tying goal in the 72 minute, as the game ended in a 1-1 draw. Despite not making the post-season, the team can be quite happy with their progression from last year. They improved their win total, from one in 2013 to four in 2014, and also doubled their total goals, from eight in 2013 to 16 in 2014. In early season stats, Sharman leads the team, and is tied for fifth in the conference in points with six. She also leads the team in goals with four. Serhan, Litchfield-Medd, and Michelle Pawluk are all currently tied for the team lead in assists with three. Dyck is currently first in the conference, with a 0.73 goals against average. Her GAA, and total goals against, are also both tops in the CIS among goalies who have played at least four games. Mavignier’s eight total goals tied her for third in the Canada West . She also finished tied for fifth in total points, with 17. Her shooting percentage of 40 was also first in the conference, for players who had at least 10 shots on net. Robyn Kastner finished the season tied for fifth in the conference in assists, with four, and goalie Martina Arran’s two shutouts tied her for sixth in the conference overall. For the first time since 2009-10, a Manitoba Bison was selected as a CIS Top 8 Academic All-Canadian. Volleyball player Brittany Habing, currently in her second year with Manitoba after transferring from the University of Winnipeg last year, received the honour after finishing 2013-14 with a brilliant 4.0 GPA in science. “I am honored and humbled to receive this recognition. I feel this award highlights the hard work done on and off the playing field by student-athletes across the country,” Habing told gobisons.ca. One female, and one male student-athlete from each region (eight overall) across Canada are selected annually as CIS Top Eight Academic All-Canadians. On Oct. 10-12, the Winnipeg Wesmen hosted a pre-season basketball tournament at the David F. Anderson Gym. The four-team tournament included Winnipeg; Manitoba; Brandon; and Lakehead. Despite going 0-3, Robin Eyer still had an impressive overall performance. Against Winnipeg, the Bisons’ cross-town rivals, Eyer led the team with eight points, and was also 2-3 from the three-point line. She was named a tournament all-star for her efforts over the three-day tournament.